For me, "Remote" really brought up the concept of geographical isolation. Two excellent books have gotten me thinking about island zoology and biodiversity again: David Quammen's The Song of the Dodo and the beautiful photographic book South Sea Islands: a Natural History by Rod Morris and Alison Ballance. I also had a number of Tim Flannery's books in mind while composing this. This is very much an Illustration (complete with explanatory text) rather than a work of art :). I've wanted to do maps along these lines for a while. This is actually pared down a lot - I took out quite a few, such as the Galapagos Islands, French Polynesia and even The Falkland Islands - just to make it smaller. In a sense it covers a lot of the ground followed by great naturalist Alfred Russel Wallace, the other, somewhat forgotten evolutionist whose observations in these regions brought him to the same conclusions (at the same time) as Darwin. The Southeast Asian cutoff is along the Wallace Line. I remember a long time ago looking at pictures of eastern and western spinebills and noticing how clearly their diversification - different realizations of the same pattern - showed evolution in action. Nowhere is speciation made more clear than on remote, isolated islands. 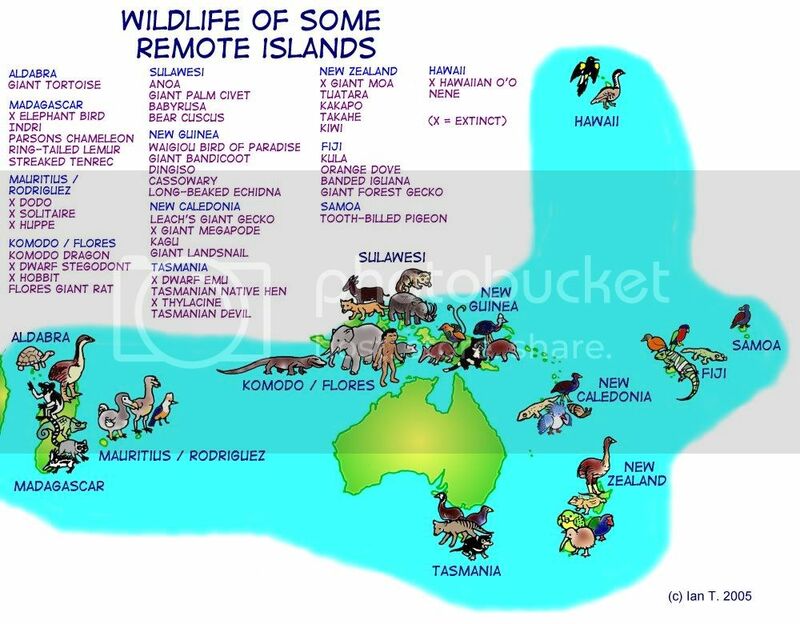 These places have to "make do" with the species that get there, either by being cut off from main landmasses at some point (allowing for the survival of primitive, relict families), or by being reachable only by swimming, flight or floating on vegetation. Following this haphazard species arrival fauna evolves into the available niches, though usually following a pattern of dwarfing of large species and enlarging small ones. Of course, this all changes when modern people arrive, leading invariably to the high extinction rate among island species. For that reason, quite a few of the creatures shown here are extinct in comparatively recent times. However, many of them do still survive - at least until the Greenhouse Effect gets worse - and these include some of the most bizarre birds and beasties. There is also inter-relationship between many of these species, such as the dodo and solitaire (and those mourning the dodo might like to look closely at the tooth-billed pigeon of Samoa). These three are clearly pigeon family descendants - other "arrival" species evolved from mainland species include the Fijian banded iguana and the Nene (Hawaiian goose), evidently evolved from the green iguana and Canada goose respectively. And then there's Australian mainland - which is a study of geographical isolation all on its own - but outside the parameters I set myself here :). Nice job. It's great to see a Natural History/Scientific approach to this. This points up what true "illustration" is about; the dissimination (or clarification) of information in a visual form rather than a verbal form, and you did it remarkably well. Bravo! Love maps, you have put a lot of work into this one! Alfred Russel Wallace was actually first to Darwin - just not as famous. Really like your submission this week! Very interesting and the map illustration is very fitting. I'll have to take a look at the books you suggested. Good post! I like maps esp. when it is illustrated like this one. great job! This is a great posting!! Love it!! this has been really interesting to me...both the illo and the write-up. i really love your continued use of literature in your work as a reference. This is incredible Ian. Wonderful work! I love this idea. Thanks, too, for sharing your knowledge of this with us. Impressive! Great map, and I love your creatures - I looked at them as large as I could and wished I could even see them larger, they are so nicely done. Great choice for the theme, which was not an easy one to me. Cool map, Ian. When I was a kid I used to love looking at maps that were illustrated like this. You had asked me about how I created the cartoon on my site. I drew itcompletely in Flash MX using Wacom tablet and saved it as a jpg. I think for natural drawing in a vector tool, Flash cannot be beat. Thanks, all! I do have a larger TIFF version of this picture (finished separately), which prints out okay. Also, I was sorry to have to cut it back this far - particularly leaving out some other nifty beasts, such as the Falkland Islands dog (now extinct). Tony, thanks, I really should check out Flash! The guys who make the Alpha-Shade webcomic (and now print book) use it exclusively. I still haven't quite made the jump to drawing from scratch on the computer (I don't own a Tablet either), but I reckon I could have some fun with animation in Flash as well. If you have a moment, please visit my music store Finland site.